Giovanni is an online (Web) environment for the display and analysis of geophysical parameters in which the provenance (data lineage) can easily be accessed. This user guide provides assistance on how to use Giovanni and information on Giovanni's data products and services. As of early January 2019, it is necessary to use the Earthdata Login username and password to access full Giovanni functionality and data holdings. Prior to early January 2019, all Giovanni visualizations could be generated using the complete data archive, but Earthdata Login was required to download data. The Giovanni interface will now show the splash screen below when first accessed. This splash screen disappears when the Earthdata Login username and password are entered by clicking the “Login” button, and can be turned off (using the “Do not show again” check box) for subsequent Giovanni sessions. If an Earthdata Login username and login are not entered, a user can proceed in “guest mode” by clicking on the “Continue with limited access” bar to access Giovanni functions and data with restricted capabilities. To receive an Earthdata Login username and password, please visit the Earthdata Login page and click the “REGISTER” button. Using the Giovanni user interface, it is possible to easily find and display selected data on various types of plots. It is also possible to download the plot source files in NetCDF format (and other formats). The main sections of the interface are described subsequently. The section titles are linked to short demonstration videos. At the top of the interface are menus for the various kinds of visualizations available in Giovanni. Selecting a visualization will cause it to be highlighted in yellow. The default option is the Time-Averaged Map. The image below shows the menu of Time Series options which appears when the Time Series button is clicked. After Time Series: Hovmöller, Latitude-Averaged was selected, this Visualization Type is highlighted. The next section of the interface to examine is the Date Range Selection section. Begin Dates and End Dates are selected with drop-down calendars, as shown below. The dates may also be entered manually, in YYYY-MM-DD format. Error messages will indicate if the date range is entered incorrectly. Note: if monthly data products are selected prior to selection of the date range, the Date Range selector will only allow choice of year and month. The section to the right of the Date Range section is the Select Region section. There are three options for the specification of the Region-of-Interest: manually (with latitude-longitude boundaries for a rectangular region), with the interactive map by click-and-drag with the cursor, or by selecting a Shapefile area from the Shapefile menu. Latitude-Longitude coordinates are entered as West, South, East, and North, with western longitudes and southern latitudes entered as negative numbers. Decimal coordinates are used in this case. If the cursor is used to select a region, the selected region will appear as shown below. The latitude-longitude boundaries will be shown automatically. Shapefiles are chosen from the Shapefile menu. U.S. States, Countries, and Major Watersheds are shapefile options. Clicking in the radio button to the left of the country name selects that shapefile. The selected shapefile boundaries are not shown on the map. Variable selection with the Giovanni interface can be performed via two different methods. The first method is Faceted Search. For Faceted Search, the options on the left side of the interface are shown, with many options listed under “Measurements”. For this example, CH4 (methane) was selected. Eight different data variables for methane were available when this selection was made. All eight of the variables are listed, and the desired variable or variables can now be selected. The other Variable Search method is Keyword Search. A keyword is simply typed into the Keyword field above the search results box, and the Search button is clicked. The example below shows some of the results provided when the keyword Dust was entered. Not all of the variables, 18 in total, could be shown here. Again, once the results are displayed, the desired variables can then be selected for analysis. Once all the necessary information has been entered and a data variable or variable has been selected for analysis, a Giovanni user simply clicks the green Plot Data button to initiate the analysis. The next screen will show processing steps in progress. If an error message is encountered during processing, the user can click the Feedback button to capture the workflow for an email message, and send it to the Giovanni Development team, where it can be investigated. The following example shows some possibilities for replotting. Note that the maximum and minimum data values for the color palette range can also be adjusted, and the plot can be displayed with either a linear or logarithmic scale (the latter is mostly used for types of ocean data). The initial result for the Tropical Rainfall Measuring Mission (TRMM) 3A12v7 monthly Rain Rate variable, plotted over the southwestern United States in January 2009, is shown below. Note that the map can be zoomed ( +/- controls at top left) and moved by clicking and dragging with the cursor. Here is the map, zoomed and moved to center on the plotted region. For the replotting options, click on the box labeled “Layers” at top right. To refine this plot, the following selections were made – adjustment of the color palette value range, change of the actual color palette, and contouring of the data pixels (called “Smoothing” in the box, but this operation is not an actual mathematical smoothing calculation). Giovanni uses matplotlib's filled contour algorithm to create contoured plot images. This algorithm removes the line boundaries between data pixels. To output this image, click on Download, which provides the three options shown below. Following the ‘Projections’ section, these download format options are explained in the ‘Output Options’ section. 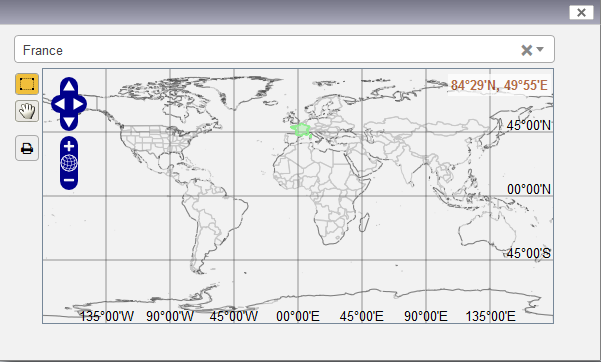 Polar Projection options were added with the release of Giovanni Version 4.24. This addition added a new ‘Projection’ field to the Replotting Options box, shown below. Equidistant Cylindrical is the default map projection. 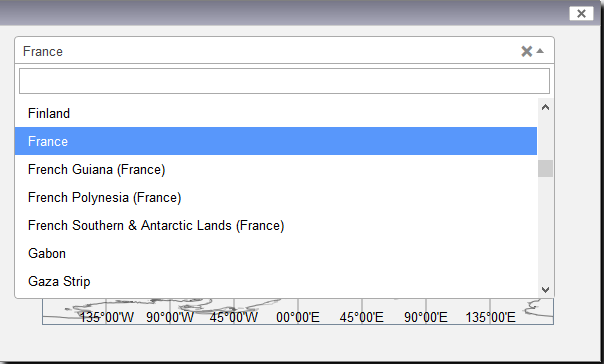 Clicking on the down arrow shows the two polar projection options (highlighted in the image below). Below is the Equidistant Cylindrical plot and the South Polar projection plot of daily ozone concentration data (in Dobson Units) from the Ozone Measuring Instrument (OMI) for the period October 15-17, 2010. For a full polar projection plot, choose -180 as the West longitude and 180 as the East longitude. KMZ – A KMZ file is an output in Keyhole Markup Language (KML). This format is supported by Google Earth and allows images to be imported into Google Earth. PNG – A standard image format. GeoTIFF – GeoTIFF is a public domain metadata standard which allows georeferencing information to be embedded within a TIFF file. GeoTIFF (.tif) files can be used in Geographic Information Systems (GIS) applications. 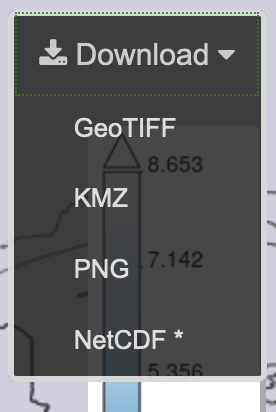 It is not possible to download an actual GeoTIFF image from Giovanni. In addition to the three image format download options described above, the data for the mapped image can be downloaded as a NetCDF file (.nc extension). To access the NetCDF file, and also the three image format file options, click on ‘Downloads’ in the History tree at right on the output display page. A time-series plot can be downloaded as a PNG image. The data in the time-series plot can be downloaded as a Microsoft Excel Comma-Separated Values (CSV, .csv) file. This output data can also be placed in other spreadsheet applications, such as Google Docs or Open Office. For most of the plot options in Giovanni, the actual plot can be downloaded as a PNG file, and the data is available as a NetCDF file. We request that the Goddard Earth Sciences Data and Information Services Center (GES DISC) be specifically and clearly acknowledged if Giovanni (or data downloaded from Giovanni) is used for data analyses and visualizations in publications, posters, oral presentations, reports, Web pages, and other types of scientific media. If assistance from GES DISC staff members is obtained which contributes substantially to scientific content, co-authorship is appropriate. “Analyses and visualizations used in this [study/paper/presentation] were produced with the Giovanni online data system, developed and maintained by the NASA GES DISC." Meeting presentations: If Giovanni data visualizations are utilized in public presentations (particularly scientific meeting presentations), we would like to know. Such information is very important as justification for continued Giovanni funding and development! We would greatly appreciate a short email message providing the title of the presentation, the abstract (if available), and the meeting where it was presented. Please send this message to gsfc-help-disc@lists.nasa.gov with “Giovanni presentation information” as the Subject. J. G. Acker and G. Leptoukh, “Online Analysis Enhances Use of NASA Earth Science Data”, Eos, Trans. AGU, Vol. 88, No. 2 (9 January 2007), pages 14 and 17. Both Giovanni and the mission or activity which provided the data should be acknowledged. Giovanni provides information about the mission or activity which produced the data. If further guidance is required, contact the GES DISC Help Desk, or contact the data source directly. "We also acknowledge the MODIS mission scientists and associated NASA personnel for the production of the data used in this research effort." "We acknowledge the mission scientists and Principal Investigators who provided the data used in this research effort." Data in the Giovanni system is acquired from many different missions and activities (such as modeling). Extensive use of the data may require consultation with mission scientists and consideration of co-authorship for these scientists. Responsibility for granting co-authorship and providing acknowledgement in published research publications and other forms of scientific communication ultimately resides with the primary author. Shapes are treated differently depending on whether or not Giovanni needs to average over the region or simply subset the region. When Giovanni averages over an area in services (such as Area-Averaged Time Series), the shape is rasterized (converted to pixels) at a resolution four times higher than that of the data. The high-resolution raster array is then regridded to an array equal to the data resolution, with weights proportional to the amount of shape coverage in each cell. The shape coverage weights are then further weighted by the cosine of the latitude, as described in the section on calculating statistics. These weights are used in the area averaging computation to enforce that cells with lower shape coverage have a smaller influence on the resultant average. When Giovanni uses the shape to subset a region, in services such a Time-Averaged Map, the shape is used to mask the data and keep all grid cells that at least partially overlap the shape. Land-Sea mask data are included as two shapefiles, “Sea Only” and “Land Only”. These shapefiles enable land & sea masking capability. For example, if a bounding box is defined and the “Land Only” shape file is selected, then the defined region is Land-Only within the bounding box. 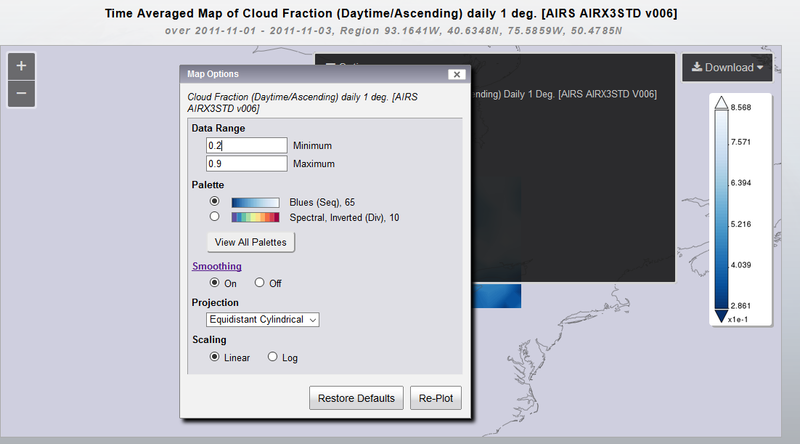 Currently two plot types, Time Averaged Map and Area-Averaged Time Series, are enabled for land sea masking capability. In Giovanni, we derived a new sea mask from the original by defining the water surface as greater than or equal to 75% water. For data sets with different grid resolutions, a regridding algorithm is applied to this mask to derive a compatible mask for the corresponding grid resolution of the data. If Giovanni encounters a data gap while processing data for a visualization, the workflow to create the visualization will continue. In the case of a time-series plot, there will simply be a gap in the line connecting the points when observational data was available. If the Giovanni visualization is a map averaged over the period during which the data gap occurred, the map will be created with all the data available during the time period specified for averaging. For data variables that are available as monthly averages (sometimes referred to as spatially and temporally binned data), the data provider may have created a monthly average with all the data available for that month, even if there was a data gap during the month. In this case, the data gap will not be apparent in the Giovanni output. If a user is concerned about this possibility, data documentation from the provider should be consulted. Most Giovanni services calculate aggregate statistics of some sort along one or more dimensions in time and space. With the exception of statistics for the Histogram plot, both these statistics use weights. Weights are the cosine of the center latitude of the data point being weighed. In the case of shapes, weights are further adjusted as described in "Using Shapes to Specify Areas." Formula for weighted standard deviation. These statistics are calculated for all valid data points in the selected area (i.e., fill values are excluded). For areas specified as bounding boxes, all data points whose grid center is within the bounding box are included. For shapes, all data points that at least partially overlap the shape are included. The count is the total number of included data points, the minimum is the smallest value of the included data points, and the maximum is the largest value of the included data points. Some of our services (such as correlation) are required to pair two variables in time and space. If the two variables have different spatial resolutions, the finer resolution is regridded to the coarser resolution using the lats4d application. The time-averaged map shows data values for each grid cell within the user-specified area, averaged (linearly) over the user-specified time range as a map layer. Fill values do not contribute to the time average value. The generated map can be zoomed and panned. 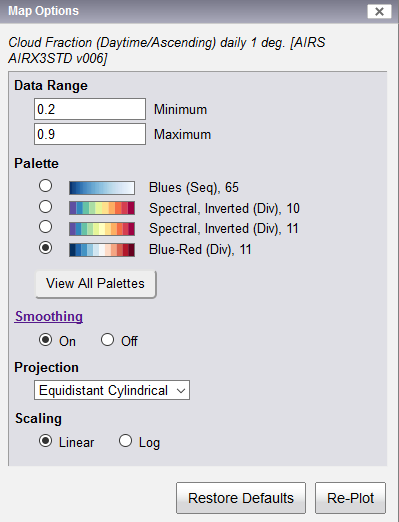 Plot options include setting minimum and maximum values for the color scale, and in some cases selecting other palettes. Example: Time-Averaged Map of precipitation from Typhoon Chapala, for the period October 27 to November 2, 2015. Vector magnitude maps, such as those for wind speed magnitude, compute the magnitude of the vector at each time step first before averaging the magnitudes of each grid cell together across time. In contrast, vector maps compute the averages of the latitudinal and longitudinal components of each grid cell across time and display the resulting vectors. The Animation service shows individual time slice maps of a data variable in an animated sequence. Each file included in the animation can be downloaded in a .zip file that contains each image in PNG format. These can be used to create an animated video in other applications. The Seasonal or Monthly Average maps compute averages for either a specific month or a 3-month period corresponding to the meteorological seasons (DJF=Dec,Jan,Feb; MAM=March,April,May; JJA=June, July, August; and SON=Sep, Oct, Nov). The average values are computed over the years specified in the selection screen and displayed in a map. More than one month or season can be selected. This service is only available for monthly data. 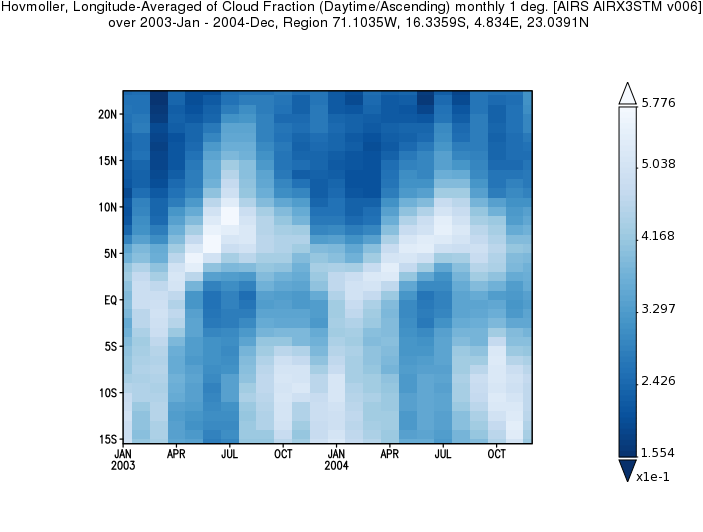 Example: Average of April months over the years 2010-2015 for Combined Dark Target Aerosol Optical Depth (AOD) Mean of Daily Mean data – the region is Northwest Africa and the northern equatorial Atlantic Ocean. Example: Accumulated rainfall, Global Precipitation Measurement (GPM) Integrated Multi-satellitE Retrievals for GPM (IMERG) Late Run product, May 12-22, 2016. The Time-Averaged Overlay Map allows different options regarding the visualization of data. Option 1: A map colored according to the data values in a color palette can be combine with contours showing the numerical values of the same data variable. Option 2: A map colored according to the data values in a color palette can be combined with contours showing the numerical values of a different data variable. Option 3: Color or contour maps can be combined with data variable depicted as a vector. If both a color map and contour map are used, the vector variable can also be shown as the third variable in the map. The data range of the color palette and contour map can be changed according to user preference, and the spacing of the contours can also be specified. 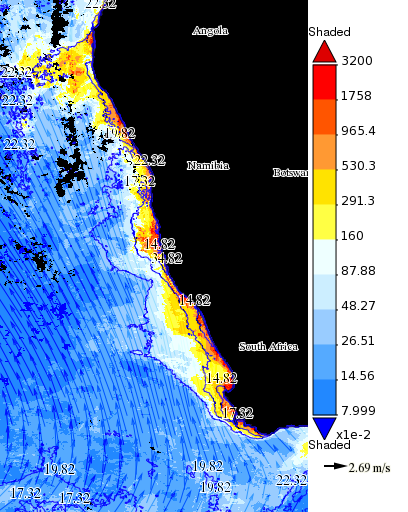 Example: The map of the Benguela Upwelling Zone on the west coast of southern Africa shows chlorophyll concentrations in color, sea surface temperatures as contours, and wind speed as vectors. The winds blowing in one constant direction cause deeper, colder water with nutrients to come to the surface, increasing the growth of phytoplankton, which contain chlorophyll. The correlation map calculates the correlation coefficient using simple linear regression between two variables over time within each grid cell, producing two maps: one showing the correlation coefficient (R) and the other displaying the number of contributing (matching) samples in each grid cell. (Note that the values from both variables must be non-fill values, in order to contribute to the correlation computation.) Any grid cell that contains fewer than three matched pairs over time will be assigned a fill value. An additional product of the correlation computation is an average at each grid cell of the differences between the two variables at each time step for that grid cell. This map may contain more values than the correlation map, as the differences will be computed for as few as one non-fill matched time step in a grid cell. Example: Correlation Map of Monthly Tropical Rainfall Measuring Mission (TRMM) 3B43v7 Precipitation Rate and Atmospheric Infrared Sounder (AIRS) Monthly Daytime Cloud Fraction. The precipitation rate and cloud fraction would be expected to be significantly correlated, as cloud cover is frequently associated with rain. Because this is an annual correlation map for the year 2012, the areas where there is a negative correlation are probably due to winter snowfall, as TRMM did not measure snow as precipitation. Thus, for winter storms, there would be cloud cover but no observed precipitation. The scatter plot produces a (static) scatter plot of all data pairs from two selected variables. The data pairs are matched in both space (grid cell) and time. The plot shows both the scatter and the parameters of the simple linear regression, i.e., slope, offset and correlation coefficient (R). Caveat: the averaging that occurs within regridding may produce an artificially high correlation coefficient; interpret with care! Example: Scatter plot of Cloud Fraction vs. Precipitation for July 2012 over the contiguous United States (the same region as used above). 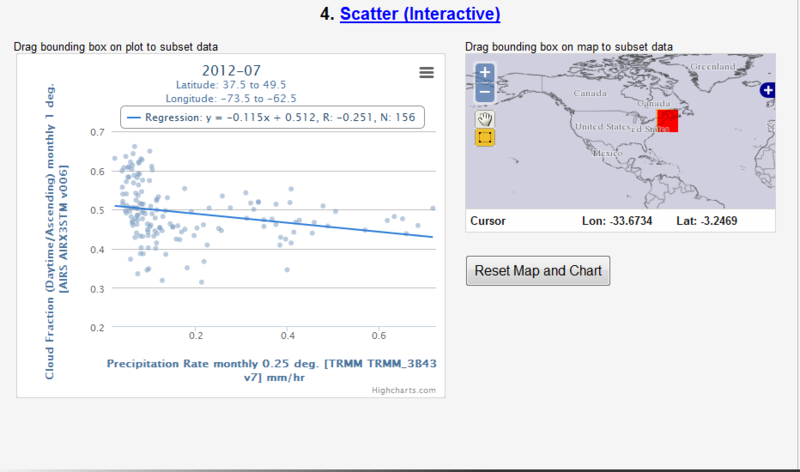 The interactive scatter plot produces a scatter plot and a map showing the location of data pairs in the scatter plot. Users can select data pairs of interest by selecting data pairs (click and drag on the scatter plot). Users can also select locations of interest by selecting region of interest in the map. 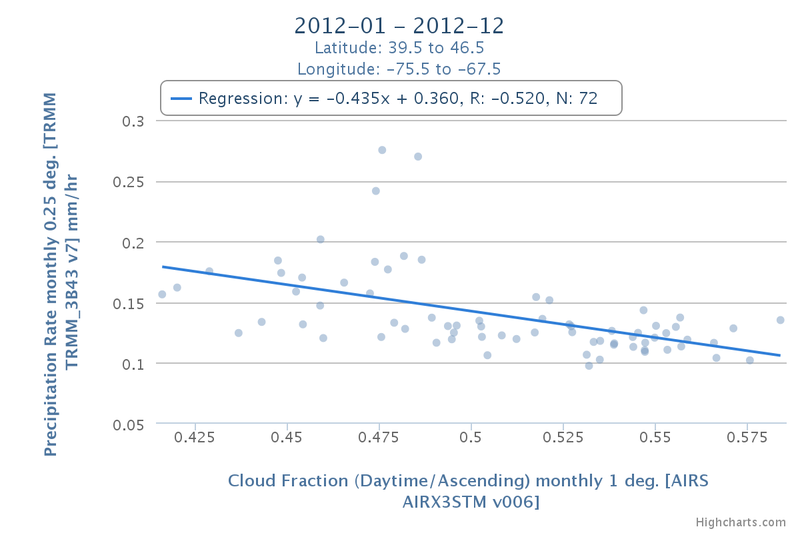 Example: Interactive Scatter Plot of monthly AIRS Daytime Cloud Fraction data vs. monthly TRMM 3B43v7 precipitation rate data for July 2012. The first image shows the entire area. Clicking on a point in the scatter plot will provide the geographical coordinates of that pixel and the corresponding data values. The second image shows a smaller area derived from the first area. The scatter plot now shows only the points corresponding to that area. The Time-Averaged Scatter Plot produces a scatter plot of all co-located points averaged over time and a map showing the location of data pairs in the scatter plot. Only values that are non-fill for both data fields at a given time-step are used in the computation of the averages over time for each grid cell. Users can select data pairs of interest by selecting data pairs (click and drag on the scatter plot). Users can also select locations of interest by selecting region of interest in the map. Example: For a similar area as used above, but now averaged over the year 2012. Note that the data products are reversed on the axes. The Area-Averaged Scatter Plot computes an average over the selection area for each time step of two separate variables. The resulting values are matched up by time and plotted as an X-Y scatter plot. All cells whose center point falls within the selection box are included. 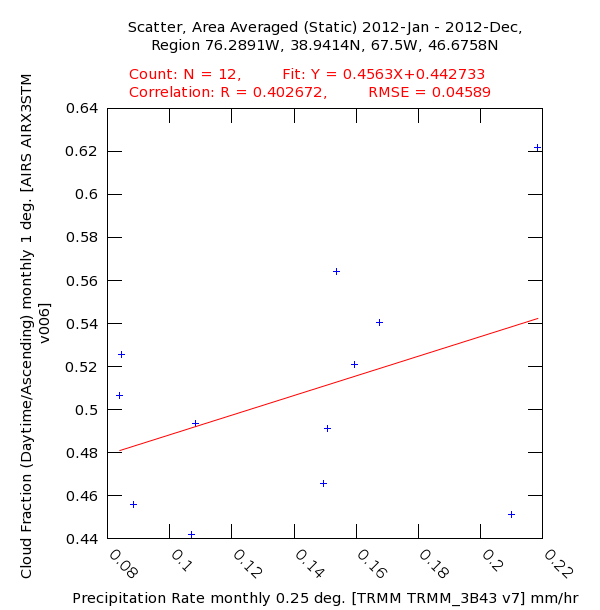 Example: Area-Averaged Scatter Plot of monthly AIRS Daytime Cloud Fraction data vs. monthly TRMM 3B43v7 precipitation rate data for 2012 in the northeastern United States (approximately the same area as used for the second interactive scatter plot above). The Difference of Time-Averaged Maps computes the time average for each grid cell for two variables being compared. The differences between the two resultant maps are then computed and plotted on a map. Only variables with the same Measurement and Units can be differenced in this way. Fill values in either resultant map are not included in the final difference. 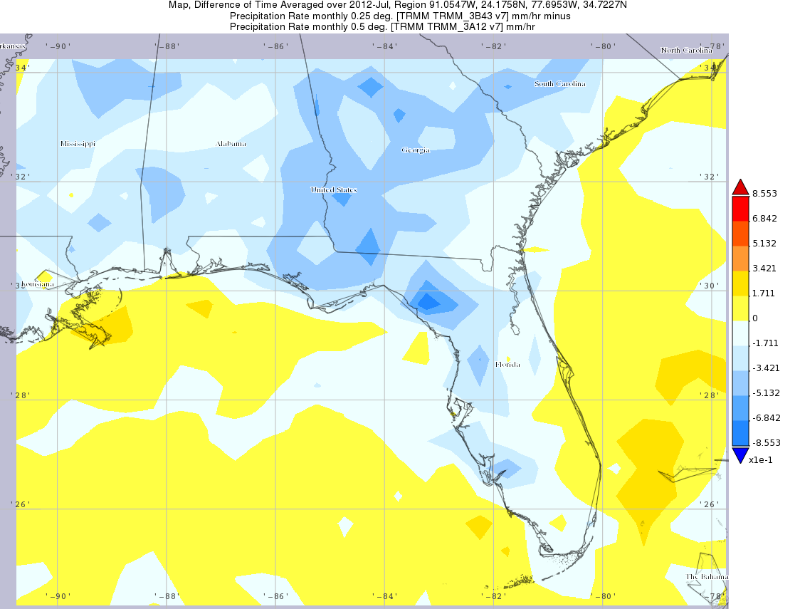 Example: Difference between two TRMM precipitation rate data products, 3B43v7 – 3A12v7 , for July 2012, over the southeastern United States. The predominance of negative values (blue) indicates that the 3A12v7 product estimated higher precipitation rates than the 3B43v7 data product. The standard Giovanni time-series plot is produced by computing spatial averages over the user-selected area of a given variable for each time step within the user's range. Fill values do not contribute to the spatial averages. Each average value is then plotted against time to create the time-series output. 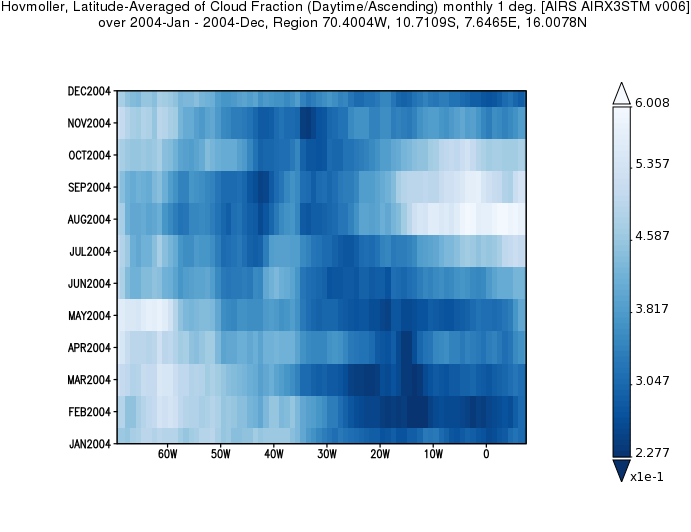 Example: Area-Averaged Time Series of AIRS Monthly Cloud Fraction (Daytime/Ascending) over Maryland for the years 2003-2005. The Seasonal Time Series computes an area-averaged time series for each year in the user's selection for a given month or 3-month meteorological season, To avoid biasing the results, partial seasons (i.e., missing one or two months) are not plotted. Meteorological winter (Dec-Jan-Feb) is labeled with the year in which January falls, so DJF for 2007 goes from Dec 2006 to Feb 2007. This service is available for monthly data only. 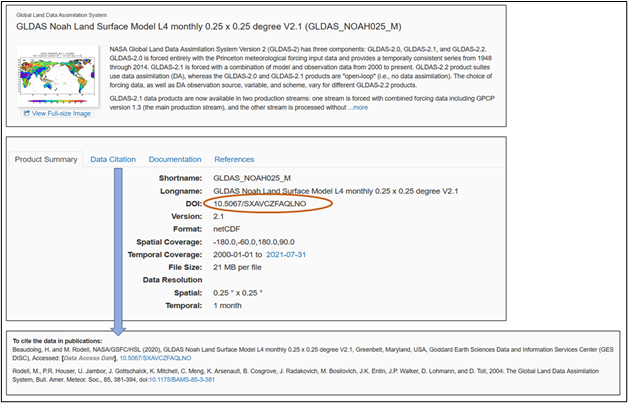 June 2017: Giovanni Release 4.23 includes shapefile support in this service, and also provides comma-separated-variable (CSV) text download for the values shown in any interannual time-series plot. 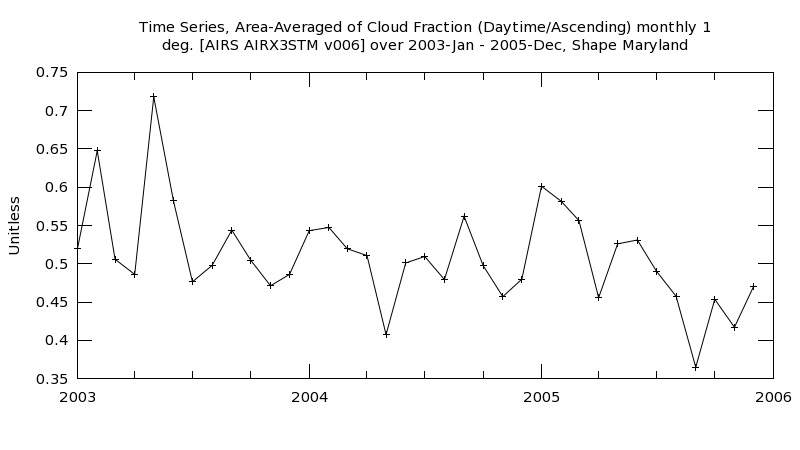 Example: Seasonal Time-Series of Area-Averaged Time Series of AIRS Monthly Cloud Fraction (Daytime/Ascending) for an area covering the state of Maryland and parts of adjacent states, 2003-2014. The Hovmöller plot averages over either latitude or longitude at each time step and creates a two-dimensional color slice plot for the remaining horizontal dimension vs. time. Lat vs. time Hovmöller plots show latitude on the vertical axis. Lon vs. time Hovmöller plots show longitude on the horizontal axis. Example, Lat vs. Time Hovmöller Plot: This plot shows AIRS Monthly Cloud Fraction (Daytime/Ascending) for the tropical Atlantic Ocean in 2004, including the near-coastal areas of South America and Africa. During the rainy season, cloud fraction increases on the western side of the Atlantic over South America. In autumn, tropical weather systems that can become tropical storms or hurricanes increase cloud fraction on the eastern side. 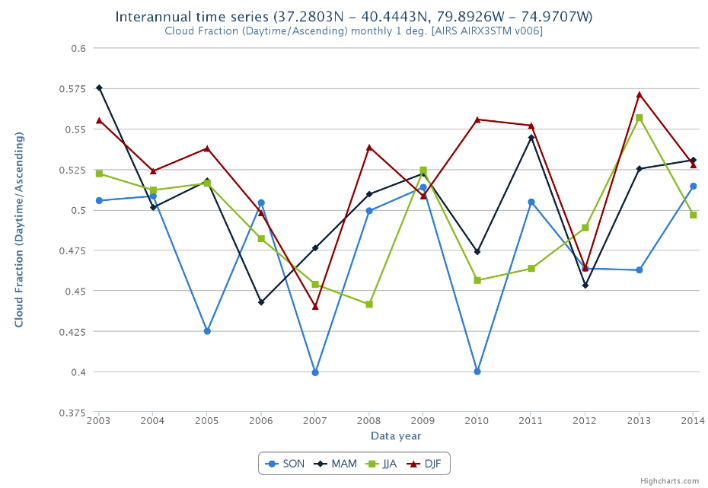 Example, Lon vs. Time Hovmöller Plot: This plot shows AIRS Monthly Cloud Fraction (Daytime/Ascending) for the tropical Atlantic Ocean in 2003, showing the seasonal location of clouds associated with the Intertropical Convergence Zone (ITCZ). This service compares two variables over time by first differencing the first variable from the second at each grid cell, and then computing the average difference over the user-selected area. The area-averaged difference is computed over a geographic (Cartesian) map. 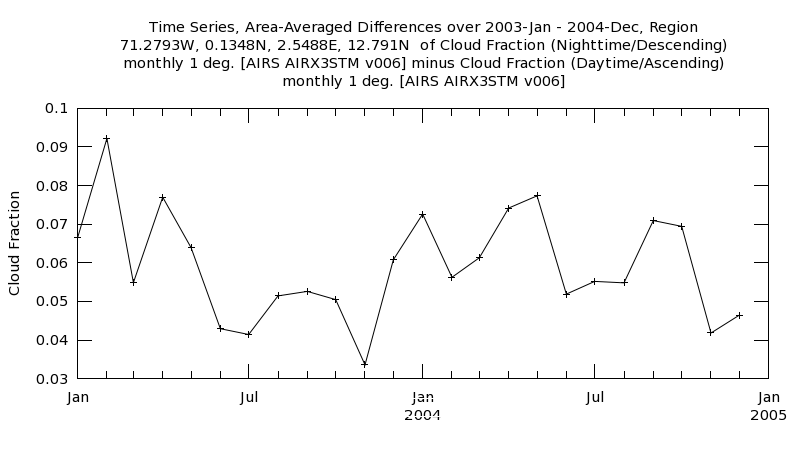 Example: Time-Series of Area-Averaged Differences for AIRS Monthly Cloud Fraction (Daytime/Ascending) and Monthly Cloud Fraction (Nighttime/Descending) for the tropical Atlantic Ocean, approximately from the Equator to 12 degrees N. The smallest difference occurs when there are less clouds overall, in October. This service creates a two-dimensional representation of data parameter values plotted in pressure or altitude (in the vertical dimension) vs. latitude (in the horizontal dimension). The data parameter values in the Cross-Section Plot are interpolated and displayed in log-scale. The data are averaged over longitude, and the service will generate a profile rather than a cross-section if a single latitude value is selected. This service creates a two-dimensional representation of data parameter values plotted in pressure or altitude (in the vertical dimension) vs. longitude (in the horizontal dimension). The data parameter values in the Cross-Section Plot are interpolated and displayed in log-scale. The data are averaged over latitude, and the service will generate a profile rather than a cross-section if a single longitude value is selected. This service creates a two-dimensional representation of data parameter values plotted in pressure or altitude (in the vertical dimension) vs. time (in the horizontal dimension). The data parameter values in the Cross-Section Plot are interpolated and displayed in log-scale. The data are averaged over longitude and latitude and will generate a profile rather than cross-section if the Begin Time and End Time are the same. Several of the variables in Giovanni have a vertical dimension in addition to the horizontal dimensions of Longitude and Latitude. 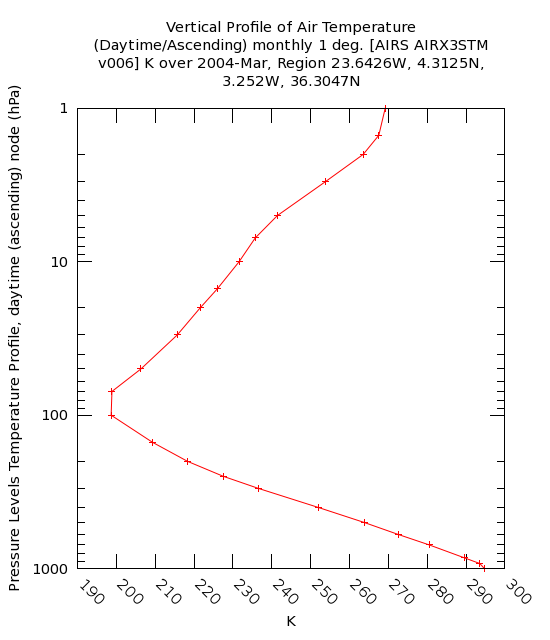 For example, the Atmospheric Infrared Sounder (AIRS) data variables of temperature, relative humidity, and some atmospheric gases (including methane and ozone) have a vertical dimension of atmospheric pressure. The vertical profile plot option displays a profile of the given variable, which is first averaged over the user-selected region and then over the selected period. Example: Vertical Profiles of AIRS Monthly Air Temperature and Relative Humidity for the eastern tropical North Atlantic Ocean off of northern Africa. The Saharan Air Layer is characterized by low relative humidity. The Zonal Mean over a given area is the sequence of data generated by taking the average over a range of longitudes for each latitude. The Zonal Mean calculation only works with data in a single atmospheric layer (defined by pressure in hPa), such as 300 hPa as an example. The zonal mean cannot be calculated for a pressure range, i.e., for the range 300-400 hPa. The zonal mean operation works by exporting the data from the dataset and then averaging along the longitude axis for each latitude point. Example: Zonal Mean Plot of AIRS Atmospheric Temperature at 500 hPa for January 2010 over the United States and Canada. The histogram service computes a histogram over the values present in the given temporal and spatial selection. No averaging is done over any dimensions. Fill values in the data are dropped and not considered in the results. The unweighted sample mean, unweighted sample standard deviation, and median are also presented in a box in the top right hand corner. 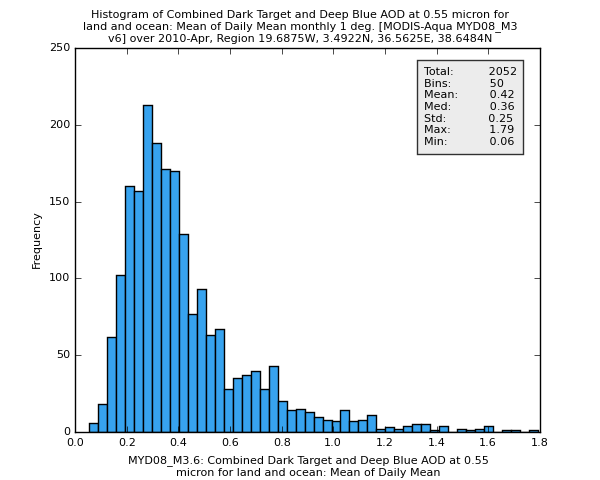 Example: Histogram of MODIS Monthly Dark Target and Deep Blue Mean Aerosol Optical Depth values for April 2010 over northern Africa. The corresponding map is shown at right. Many of the variables can be converted from the current units to different units, such as mm/hr to inch/day. This capability is indicated by an option menu in the Units column for that variable (coming soon...) For efficiency's sake, this conversion is usually applied to the output data from a given service. However, there are two cases where the conversion must be done before the processing algorithm runs. The first is for comparison services that require identical units to be sensible, i.e., the services with the word "Difference" in them. The second set of cases are those where the service algorithm aggregates (e.g., averages) the data over the time dimension. In these case, if the destination units is a monthly rate (e.g., inch/month), then the conversion must be done before the algorithm runs in order to account for the varying number of days in each month. Service requests for variables specified in monthly rate units (e.g., mm/month) will give plots bias relative to plots that use variables with daily or hourly rate units (e.g., inch/day). Plots that display the time dimension will tend to show higher values for longer months (i.e., months with more days). For example, suppose a user requests a time series of precipitation in mm/month. The March data points will show the total precipitation for 31 days while the April data points will show the total precipitation for only 30 days. Plots that average over the time dimension will have similar problems. Longer months will tend to have larger values, which will pull the average up. Shorter months will tend to have smaller values, which will pull the average down. Histogram plots will be slightly skewed by monthly units conversion. Values from longer months will tend to end up in higher-valued bins and values from shorter months will end up in lower-valued bins. 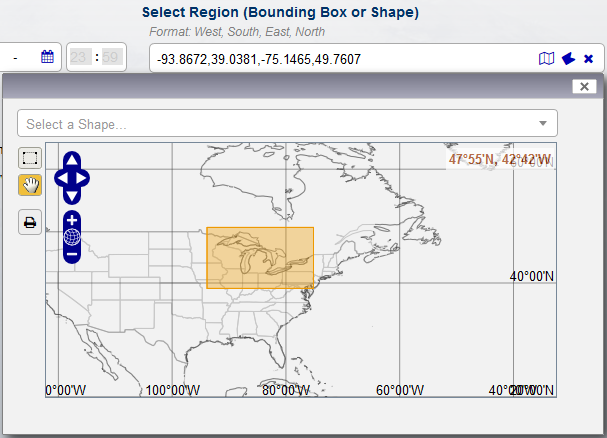 There is a new format for geographical entries to define the bounding box (region of interest). In addition to positive and negative entries (negative for South and West), the format now allows N,S,W, and E for latitude and longitude coordinates. The caption title can now be turned off. Most plots now can be used with user bounding boxes much smaller than the data resolution. If the user is in “guest mode”, i.e., the user has not logged in with an Earthdata login, the guest mode limitations will be displayed under each plot. Linear replots with negative numbers for the max value are not allowed. The splash page “freezing” issue for the Giovanni page, due to popup blocking, was fixed. Giovanni users who are not logged in are Giovanni guest users, who can access data and services, but are limited in the amount of data for each plot, and cannot download files produced by Giovanni. Giovanni guest users are limited to a maximum of 4 time points for most services, except for Interactive Scatter and Time-averaged Interactive Scatter, which are limited to 15,000 data points. Added the display of a splash screen for users who are not logged in. Made Area-Averaged Time Series the default choice for Time Series, and improved the order in which plots are listed. Fixed a problem where animation failed to generate a map when the bounding box crossed the anti-meridian. Fixed a problem where the number of points selected depended on the order that variables were selected. Fixed a problem where Time Averaged Overlay Maps had no default value provided for the interval in the contour layer options. Long titles are no longer occluded by the Layers button in interactive maps. Restored missing left margin of downloaded PNG images. Fixed a bug for 8-day daily data that caused workflow failures when a specific time interval was selected. Pre-generates GeoTIFF files if they are larger than 10 megabytes, in order to prevent timeouts that occurred when the files were not generated until the download link was clicked. Hovmöller Plots are now shown with a contoured output, rather than a discrete pixel display. Data grid information has been added to the caption for non-shapefile cases. For any area-averaged service, except for shape, we display the data grid and the requested bounding box. This data grid information is also found in the CSV output file. The Help and Feedback button have been integrated with the Giovanni toolbar, making the user interface easier to navigate. Bounding Box input can now be cleared within the map selection tool. Waiting for System Resources time is now displayed in the Lineage. 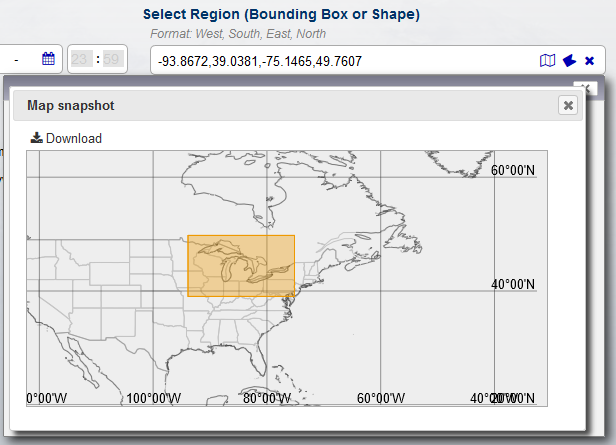 For cases when the bounding box and shapefile do not intersect, a clear error message is displayed in the user interface. Static Plots: Fixes a bug in the replot of all static plots. Setting view prior to Earthdata login. Users will see a login button on the main page. Fixed a bug with the Lineage Animation Output files where only a .txt file was being produced, and not the list of NetCDF files used to make the animation. Overlay Map: Fixed a bug that prevented download of the map. Hovmöller Plots: Fixed a bug where the Hovmöller Plot would be blank for certain temporal resolutions of data. Fixed a bug which resulted in duplicate “Workflow failed” messages. Giovanni Search has been optimized to use the temporal resolution of the data in order to more efficiently search the data catalogue. Removed the insertion of time bounds metadata in the giovanni post processing step. This fix results in faster processing of Giovanni workflow requests. Cross Section: Increased the text font size on all Cross Section plots in order to improve readability. Fixed animation download link of zip files. In this release, plot options are now available for many plot types (excluding maps, which already had a suite of plot options). Many of these plot types did not have plot options prior to this release. The plot types and the new plot options available for them are listed below. Area-Averaged Time-Series: The minimum and maximum values for the Y-axis can be changed, and a best-fit trend line can be added to the plot. Area-Averaged Scatter Plot (Static): The minimum and maximum values for both the X- and Y-axes can be changed to user-specified preferences. Vertical Profile: The Vertical Profile image can now be downloaded as a PNG image. Time Series of Area-Averaged Differences: The minimum and maximum values for the Y-axis can be changed, and a best-fit trend line can be added to the plot. Cross-Section: Cross-Section Plots now provide the capability of adjusting the Y-axis minimum and maximum values and the data range minimum and maximum values. These plots also allow users to select alternate color palettes (found at the bottom of the Plot Options selection box). Hovmöller Plots: Hovmöller Plots now provide the option of adjusting the data range minimum and maximum values, and alternate color palettes can be selected. Zonal Mean: The Y-axis minimum and maximum values can now be specified by the user. Histogram: The Histogram Plot function now allows users to select the logarithmic plot option for the data range, the Y-axis, or both. The Vector Legend is now shown on plots with plotted vectors. For maps, the Download in GeoTIFF format will now result in a "tif" file that contains map data in real science units, at the original pixel resolution. This format is intended for more advanced GIS applications. Giovanni now reads in global attributes of granular start and end time through OpenSearch. This means that granules which have neither a time dimension or time information embedded in the global attributes can still be added to Giovanni. Fixed several bugs related to maps visualizations, causing failures and delays. The titles in the User-Defined Climatology (labeled ‘Monthly and Seasonal Averages’) maps and Seasonal Time-Series plots have been modified to more accurately describe the plot. For example, “Precipitation Rate monthly 0.25 deg. [TRMM TRMM_3B43 v7] mm/hr over 2009-Dec - 2014-Feb, Region 180W, 50S, 180E, 50N” is now labeled as “Average Precipitation Rate monthly 0.25 deg. [TRMM TRMM_3B43 v7] mm/hr for DJF months 2009-Dec - 2014-Feb, Region 180W, 50S, 180E, 50N”. Vector support has been re-enabled for Time Averaged and Overlay Maps. Variables that can be displayed as vectors (such as wind velocity) can be mapped. Variables expressed as vectors can be found by typing “vector” in the Keyword Search field. The units column is now shown immediately to the right of the variable name. This will make it more convenient for the users to compare units between variables. Polar projection: This release includes support for North Polar and South Polar projections in map plots. 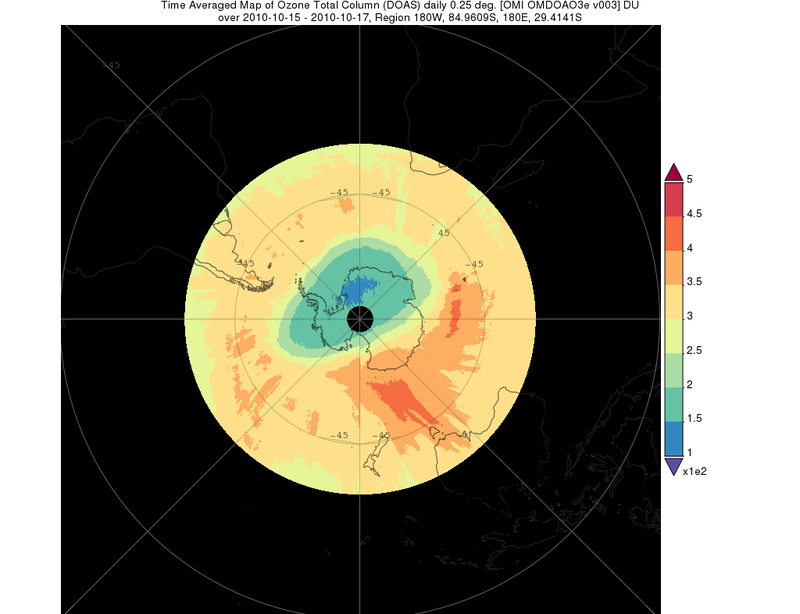 The polar projection options are accessed via the Layers box which is available when the initial plot is displayed. To obtain a full 360o polar plot, use -180 for the West longitude, and 180 for the East longitude. 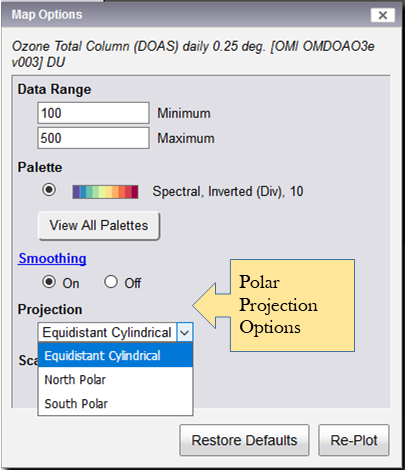 See the ‘Projections’ sub-section in the ‘Plotting Data and Replotting Options’ section of the User Manual for an illustrated description of the polar projection option. Seasonal (Interannual) Time Series with shapefile support. With this release, users can include a shape as their selected region of interest. In addition, a combination of bounding box and shape is supported, provided that the intersection of the shape and bounding box is valid for the data type. Seasonal (Interannual) Time Series with CSV download. This release supports Comma-Separated-Variable (CSV) text download for the values shown in any interannual time-series plot. Graticule layer labels are now visible for all Interactive Maps. For Interannual (Seasonal) Time Series plot and 3-D variables, the output files now have the correct label indications for the vertical level used to make the plot. Resetting the Time Variable Value. Data files now have the time dimension set more appropriately to the data set. Although the start_time attribute of the file is still the start of the temporal range of the data, the time variable is set to either the start, middle, or end of the data range of the file. This is an effort to make the plotted data make more sense, which depends on whether it is accumulated data, instantaneous data, or averaged data. Data Format. In order to incorporate the growing size of new data products, Giovanni has change the internal format from NetCDF classic to NetCDF-4. Curtain Plots. Cross-Section Longitude-Pressure, Cross-Section Latitude-Pressure, and Cross-Section Time-Pressure plots can now be rendered with a single time step. 8-day Data. 8-day data now appears under the Temporal Resolution/8-daily facet. Dimensions: All of Giovanni’s data now have bounding variables for time, latitude, and longitude. We are temporarily disabling vector variables. Time Averaged Map With Overlay. Time Averaged Map now has a variation that allows the user to examine two variables overlayed in shaded colors and contours. The user may enter several variables into the visualization, but only two can be displayed at once (3 if one is a vector variable). It's visualization is very different from Giovanni's other visualizations so review it carefully (There is a short article in the user manual about it). Land Sea Mask. Land Sea mask data are included as shape files, “Sea Only” and “Land Only”, therefore enable land sea masking capability. For example, if a bounding box is defined and “Land Only” shape file is selected, then the defined region is land only of the bounding box. Currently two plot types, “Time Averaged Map” and “Area-Averaged Time Series” are enabled for land sea masking capability. Web Coverage Service (WCS) support. The Open Geospatial Consortium (OCG) WCS interface standard that allows users to access geospatial data over the internet. The GES DISC WCS interface complies with a standard protocol, enabling clients to access data both directly, and time-averaged data utilizing Giovanni-4 capabilities (See detailed documentation in the users manual). Fixed bugs where units conversion was not working with area-averaged scatter. The new overlay map will automatically zoom you to your selected region or shape. Time Series with area-averaged statistics. Area-Averaged and Area-Averaged Differences services now include a checkbox option to display "show fitted line" and "show area statistics". This feature is available under plot options. Please see the Giovanni user manual for documentation on how these statistics are calculated. Maps animation service has been enhanced to include an option to download images as a zip file. 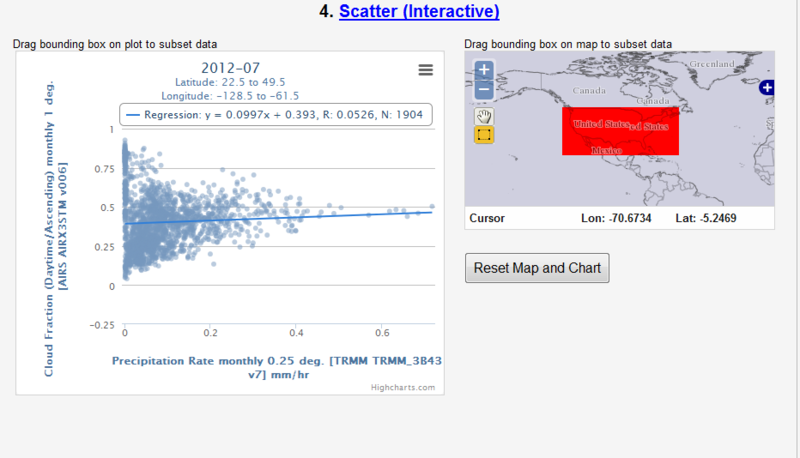 Log Scale feature added to Plot Options for all Maps services. The user now has an option to switch from the default (linear) scaling to log scale. This feature can be very useful for a subset of variables that conform to a non linear distribution. Support for additional domain requests that were previously halted by browser limitations. Maps visualization software migrated to increase performance: All Giovanni services that use Maps for visualization have been moved to a faster graphics rendering software package. The user will see a faster loading time for services that use Maps. Time Series Plot w/ Linear Regression Line can be turned on from Plot Options. The plot shows a simple linear regression line based on the user's selection in time and space. Caveat: This linear regression line does not draw a scientific trend conclusion; users use it with discretion. 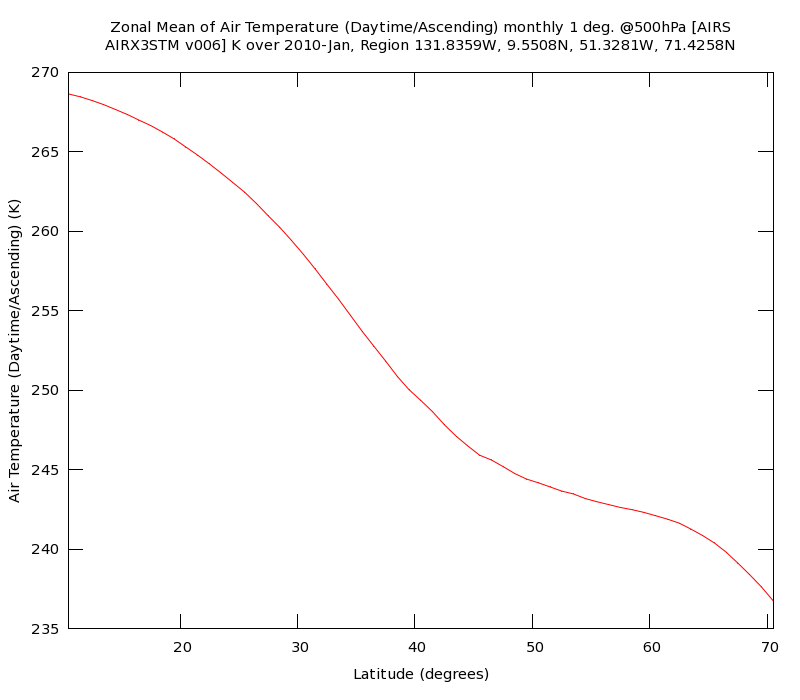 Latitude vs Altitude or Longitude vs Altitude: This service creates a two-dimensional representation of data parameter values plotted in pressure or altitude (in the vertical dimension) vs. latitude or longitude (in the horizontal dimension). Time vs Pressure: This service creates a two-dimensional representation of data parameter values plotted in pressure or altitude (in the vertical dimension) vs. time (in the horizontal dimension). Histogram with Log Scale: The Histogram service allows log-scale as a plot option. KMZ Download: The Time Averaged Map service now has a KMZ download option. Zonal Mean Plot: The Zonal Mean Plot is a sequence of data generated by taking the average over a range of longitudes for each latitude. Ad-hoc Palette/Legend Selection: After creating a map, users may now select from the Map Options Dialog the "View All Palettes" button. This will bring up the Palette Options Dialog whereby the user may choose to apply any of the available palettes not just the pre-configured ones. More variables from North American Land Data Assimilation System (NLDAS) Version 1 and 2. Units Column: The variable table has a new column containing each variable's units. Units Conversion: Selected variables can now be converted to new units as part of the workflow computation. Variables with this option have a pull down units selection menu in the units column of the variable table. Units conversion is available for services, with the exception of correlation because the correlation values do not change even if the units change. Plot Labels: The titles, subtitles, axis titles, and other plot decorations have been updated for certain plots to make them more consistent across different kinds of plots. Variables from North American Land Data Assimilation System (NLDAS) Version 2. Variables from NASA Ocean Biogeochemical Model (NOBM) Version 2014. Variables from Total Ozone Mapping Spectrometer (TOMS) including TOM-EP, TOM-Meteor 3 and TOM-Nimbus 7. Variables from Modern Era Retrospective Analysis for Research and Publications (MERRA) Version 5.2.0. 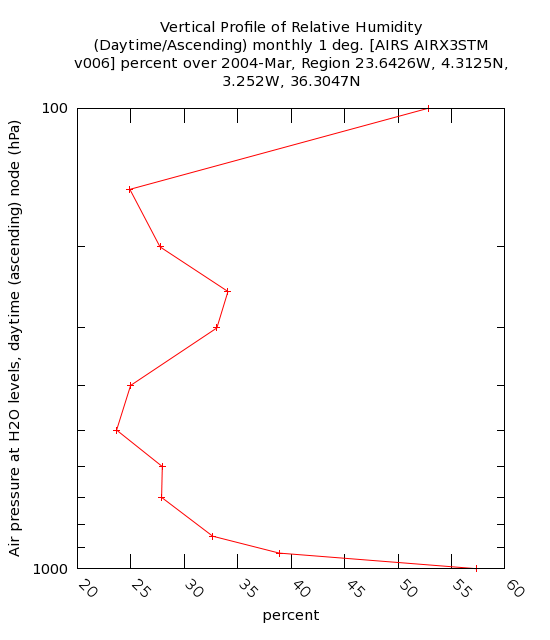 Variable from Atmospheric Infrared Sounder (AIRS) Version 6. Variables from Sea-Viewing Wide Field-of-View Sensor (SeaWIFS) Deep Blue Aerosol Climatology. Variables from Tropical Rainfall Measuring Mission (TRMM): TRMM_3B42_Daily_V6, TRMM_3B42_Daily_V7, TRMM_3B43_V6,TRMM_3B43_V7, TRMM_3A12_V7, and TRMM_3B42RT_Daily_V7. Accumulation maps computed over shapes: Compute accumulation maps of precipitation over shapes, such as countries or states. Support for watershed basin shapes: Calculate histograms, area-averaged time series, time-averaged maps, and accumulation maps over major watershed basins. Shapes for countries now use a dataset from the U.S. State Department. Limitations on request size are now computed based on total number of points (formerly time steps), allowing for longer time ranges to be used if the region of interest is narrowed appropriately. Time-averaged maps computed over shapes: Compute time averages over shapes, such as countries or states. Histogram computed over shapes: Calculate histogram over shapes, such as countries or states. Variables from the Physical Oceanography Distributed Active Archive Center (PO.DAAC), and MODIS Adaptive Processing System (MODAPS). Variables from the Global Land Data Assimilation System (GLDAS) monthly data. Time series of averages computed over shapes: Compute area averages for time series over shapes, such as countries or states. Map Animation interpolation and smoothing: Improve the visual appearance of map animation using GrADS. Fixed bugs in time series plotting: Fixed font and sizing issues with time series plots. Smoothing Maps: A new plot option produces smoothed maps for Time averaged, User-Defined Climatology, Accumulation and Correlation services. Histogram: Compute a histogram of the values present in the given temporal and spatial selection. Difference of Time-Averaged Maps: Compute time average for each grid cell for two variables being compared. Plot the differences between the two result maps. Accumulation Map: Compute accumulated values instead of averaged values for certain variables, like rainfall. Example: Plot the accumulated rainfall measured by TRMM for Hurricane Sandy (Oct 23-31, 2012) over the eastern seaboard by clicking here and then pressing the Plot button. Hovmöller Time Series: Average over latitude for the Longitude-Time Hovmöller, or over longitude for the Latitude-Time Hovmöller. Area Average Scatterplot: Compare two variables by averaging over the selection box at each time step, and plotting the results on an X-Y scatterplot. Area-Averaged Difference Time Series: Compare two variables by averaging each over the selection box and a time series of the difference between the two. The User Interface is being redesigned to be less opaque to new and occasional users. It also allows users to narrow down variables for selection either by selecting particular attributes ("faceted browsing") or filtering on keywords. However, experienced Giovanni users may see some "user interface shift shock". In some cases, certain things may seem more difficult or tedious to do than in Giovanni 3. Please tell us those things, with particular reference to how you used to do them in Giovanni 3! We may also be able to provide some short cuts (e.g., Bookmarkable URLs below). Bookmarkable URLs allow you to save URLs in order to re-run the exact same workflow at any future date. These can also be used to save partially filled in forms, acting as a kind of template for common analysis operations. This release of Giovanni contains some bugs, some known (see Known Issues below), and some not yet known. Please send us feedback using the Feedback button. Firefox / Windows: Giovanni 4 does not load in Firefox 35.0.1 for Windows when used with Squid proxy. Google Chrome and earlier versions of Firefox do not have this problem with Squid. We recommend users try other browsers if this problem occurs. iPad: Giovanni 4 has not been fully tested on iPad/iPhone Safari. Safari and Chrome on Mac: Scrollbars for the facets on the right do not show up for some Mac browsers (Safari, Chrome), unless scrollbars are set to Always in the System Preferences -> General of the Mac. Parts of borderlines on maps are missing at certain zoom levels. The Feedback button does not work properly with the Chrome browser, as it fails to open a new window for the default email application. On rare occasions, the history tree on the result page will have the wrong leaf highlighted. Clicking on any leaf in the tree will correct the problem. The plot data button sometimes fails to work right after a bookmarkable URL loads. Waiting a few seconds and trying the plot data button again should solve the problem. Displayed Maps cannot be zoomed out to the entire globe on the computer monitors with screen resolution greater than 1440 pixels in width. Latitude/Longitude grid lines and labels have been temporarily removed from the map plots. On rare occasions the map is not visible because the color palette fails to load. Plotting the map again usually resolves the problem. The Cancel button may indicate "Cancelling service now..." but not confirm that the service was in fact cancelled. The color palette "Angstrom Exponent Color Map" has colors at intervals of 0.125, except there is no color defined at 1.0, making it non-linear. Using the Re-Plot button in the Options will make the palette linear. If the bounding box is narrow and the variable name is long, the map title may be truncated in the map download. Giovanni will not show progress during the visualization stage of Overlay Map. For high resolution data over large areas Giovanni will appear to stop with a blank map. If decorations are turned off in Overlay Map, the legend still appears in the downloaded file. On Internet Explorer (IE) 11, Overlap Map rendering is limited. Plot downloads for the scatter plot sometimes render poorly, with text continuing off the plot. The max points limitation is calculated incorrectly for bounding boxes that cross the 180 meridian. The interactive scatter map won't subset if the original bounding box crosses the 180 meridian. Time series plot options for variables of the same quantity type (e.g. precipitation, aerosol optical depth, temperature) need to be set to the same values in order to ensure that all plots get the proper y-axis range. We have disabled standard deviation, min, max, and counts statistics for the time series to help address performance issues. We apologize for any inconvenience this causes and hope to have statistics back in place soon. Animation’s ‘Go To’ text field does not respond to the Enter key in Internet Explorer. Clicking outside the text field triggers the correct frame change. Animation is missing the U.S. states layer. The color bar for the animation download is quite distant from the map. The y-axis label is sometimes too long for the plot and gets cut off.